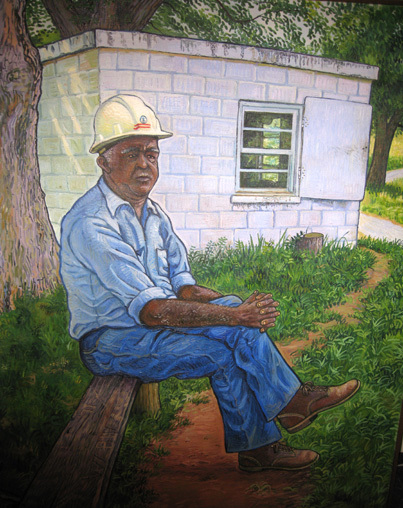 Comments: In the painting above, Ned Hocker sat in front of his cinderblock ferry master's hut at Hatton Ferry. He seized an opportunity to rest and enjoy the river before poling his next ferry load across the James. When Ned was a boy, there was only one way to get from the Hatton side of the James River to the opposite bank in Buckingham County: the pole ferry. The bridges over the James were far apart, mechanically powered transport was scarce, and travelers hereabouts had to be pushed across the river by hand. At a young age, Ned began to hang around the Hatton Ferry docks and made friends with the ferry's operators. Before very long, he seized opportunities to get the feel of poling the ferry across the river. At the age of 17, Ned was hired as a full-time operator. When the scene above was painted in 1973 by an unknown artist, Ned had poled the Hatton Ferry for 43 years. Scottsville, VA. His muscles supply all the power for raft's motion. When the first warm winds of March rustle the still-bare oaks and willows beside his century-old ferry landing, Ned Hocker looks out, as his father and grandfather did before him, onto the riffles and eddies of a James River swollen with rainfall and the promise of spring. Spring means people to Hocker, a bull-strong man of 64 who powers one of the nation's last pole ferries-a Pogo-style barge he guides as much through time as through distance. On warm weekends about 50 cars a day may ride through his tiny craft, which carries Virginia Rt. 625 from a bare Albemarle County riverbank 600 feet southward over the water to the equally empty Buckingham County shore. Hocker likes the company. "People come from all over to ride this ferry, " he says with some pride and more understanding. "Fast as people go nowadays, it seems to mean something special." The Hatton ferry is one of only four left in Virginia-a monument to the past preserved with shameless sentimentality by the people of Albemarle county and the Virginia Department of Highways and Transportation. Roughly the length and width of a flat-bed truck, it rides a Rube Goldberg cable apparatus essentially unchanged since its debut in 1835-a model of energy efficiency that makes the river current do most of the work while Hocker pokes the barge this way and that with an 18-foot, hand-hewn pine pole. The trip which costs nothing, takes about 5 minutes. Time, of course, isn't the point. "Actually, if you're on the other side of the river and I'm over here," Hocker said, "by the time I come over and get you, load you on, carry you over and unload you, you could have drove around over the bridge at Scottsville. It's only three miles down river…"
"But when I started on this river 46 years ago, they was mules and wagons crossing and it made a difference. There was a lot of ferries like this one then." Once a thriving river crossing where the railroad stopped to load pulpwood, Hatton is mostly given over now to time and the river. J.B. Tindall's general store closed when Tindall retired in 1972. A rural mail route replaced the post office. The normally placid James rose up the same year during Hurricane Agnes and carried off a barn and two frame house that stood on the bottomland just down the tracks. They never were replaced. There's noting much here now but Hocker's cinderblock ferry master's hut, the bottomland cornfields, and the faint remains of the Kanawha Canal towpath, where Hocker's grandfather drove lead horses for the canal boats in the 1870s. 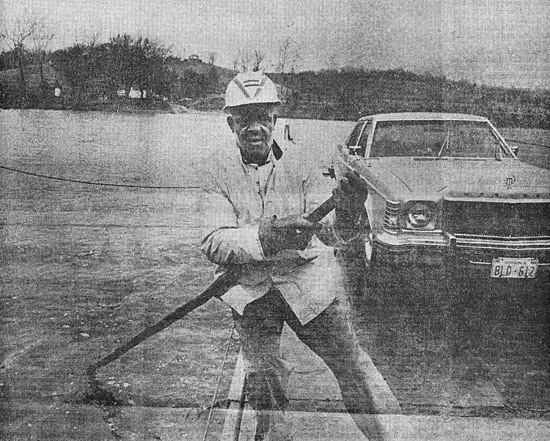 When the 1972 flood waters receded, leaving the ferry landing clotted with mud and debris and the cable damaged, the highway department, faced with millions of dollars in flood damage all over the state, decided anachronisms like the Hatton Ferry were a luxury. They decided to close it, together with the almost identical ferry that operated then at Warren, six miles upstream. History dies hard in Virginia. Before the ink was dry on the announcement, preservationists had petions circulating, Albemarle County had formed a ferry commission to check into the matter. Finally the highway people agreed to let the county pay the $9,000 annual cost of Hocker and his boat out of the county's secondary road funds. At the time of the decision, Hocker was down at Cartersville with his ferry, doing stand-in duty for a washed out trestle. He returned in time for a gala reopening here on Sept. 22, 1973, when 10,000 ferry fans turned out to see Richard Thomas, "John Boy" of "The Waltons" television series, christen the rebuilt ferry with a bottle of champagne and ride across the James in a Model A Ford. 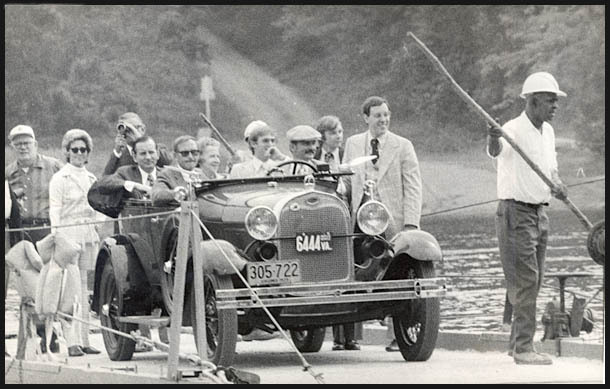 In this 22 September 1973 photo, Richard Thomas rides across the James River in an antique car aboard the Hatton Ferry. Beside him is seated Dorothy Hamner. Standing behind the car with a movie camera is James Tindall, Jr., with Bickie (Martin) Tindall. The ferryman for the dedication day was Ned Hocker, standing with ferry pole in hand at photo right. "Waltons" creator Earl Hamner, after all, grew up just up the road at Schuyler. Virginia probably could make the Hatton Ferry as much a magnet for tourism as Vermont's covered bridges are for New England. The state has never done so. You can't even find it on a state map. Ferry freaks from around the country usually just drive to Scottsville, 65 miles west of Richmond, and ask around. Eventually they find their way down the hill to Hocker, who's on duty 8 a.m. to 5 p.m., Wednesday through Sunday and always glad to see them. "I hardly ever get lonely," he said. "When the people aren't here, the river keeps me company.